I thought Interstate 22 is signed now? Is it not official yet? The newest section north of Birmingham is open, signed, and officially approved by AASHTO as regular (not "future") Interstate 22. Is there anything more needed to make it "official", and add it to the HB (along with some related change to the I-65 route file)? It's less clear that the rest of I-22 in Alabama, which is in the HB as a future Interstate, has or can be graduated to regular I-22. AASHTO's approval for the newest segment seems to assume that west of there it's still Future I-22. The Mississippi portion is even less clear, with some Future I-22 signs reportedly still posted. There's already a discussion of this in the Updates part of this forum. There are at least I-22 (not future) reassurance shields all the way to MS exit 14 according to the more recent street view images in both states. Looking there's a total dearth of any BGSs telling you what the mainline is and where it goes - it's all those reassurance signs to know the number. All the intersecting roads (save I-65) have GMSV that's at least a couple of years old. "I'm guessing straight on to Birmingham here at this major junction with US45?". If you can verify that it's signed as vanilla I-22 in more than just Jefferson County, then go for it. I drove that segment on Oct. 26 so I can confirm, yes, it is open and signed and I now have a bit of I-22 on my list. 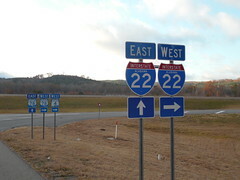 So signage shows that it is de facto I-22. The de jure is also solid, with confusing coming from AL's recent AASHTO request to convert Future Interstate 22 between Birmingham and exit 93 in Birmingham to I-22 proper. It strikes me that this is 2.879 miles of renumbering that only increased interstate mileage in the state by 0.26 miles (matching the route log on page 8's total of 96.48) is about correcting the length figure more than formalising the missing link's status as interstate. It also clearly has a map showing I-22 save the bit it is adding as part of the existing interstate system, per the 2012 request for establishment of I-22 along 96.22 miles of Future I-22 (which included the bit from 93 to I-65) that was conditionally approved pending MS submitting an application, and FHWA approval (as FHWA list 96.22 miles of I-22 in AL, and have it as part of the interstate system on the map then clearly FHWA approved it). As for MS, then the FHWA approved it as I-22, with a boiler plate "they can sign it as future until it is added to the interstate network" given to all the requests. The request said the whole route met interstate standards. I-22 in MS was an interstate on paper from May 14th 2015: 710 days ago! GMSV shows that it clearly didn't take 101 weeks to sign it. I cannot see how I-22 can be consider anything other than an official interstate all the way from Future I-269 (not yet open exit 12) to I-65. These are Froggie's states, but his last log-in to these forums were in Feb. I've made a pull request making the changes*, but it's up to Froggie (or us deciding Froggie is inactive) whether it should be pulled or chucked. *almost entirely cosmetic - the new I-65/I-22 interchange added on both routes, and a shaping point on I-22 between 93 and I-65. I renamed and moved the files, tweaked the .csvs and relabeled (keeping alt label) 'Fut269' as '12' to fit in with the rest of the route better than I-269Fut would. I'll give this a few days for @froggie to weigh in and/or for a consensus to form about how much of this route is ready to be promoted to full usai status in TM. These are based on my observations, and rlee's, noted in the previous thread. Thesis and other busy college classes have a tendency to put a crimp in one's time. I've had to cut back on a few things (this forum being one of them). FHWA updated their Interstate Route Log in February, and it shows 106 miles of I-22 in Mississippi and 96 miles-and-change in Alabama. So as long as Si's pull request fits with that, let it run. That appears to be exactly what Si's pull request brings in. I'll pull it down and run a site update. A new 2di in today and likely another very soon when the I-14 files are submitted. Check that, I see yakra submitted I-14 last night. So two new 2dis in a single site update. Looking at that map, is there really no official I-269 in Tennessee yet? James? The HB has regular I-269 in TN only from the MS border to the junction with TN385 in Collierville. North of there, the HB has it as just Future I-269/TN 385. I haven't heard anything about it being posted along TN-385 yet.